Thank you all for taking a moment to look at our baby registry. 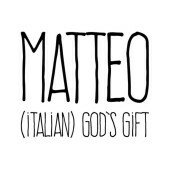 We can’t wait for the arrival of our baby boy, Matteo. We are extremely thankful for the love & support from our family and friends. Any gifts from registry or not are welcome and greatly appreciated.